This coilgun started as a stock Airsoft rifle. The stock weapon cost about 40€ (just over $50), but we think it was well worth it since it provides plenty of room for all the coilgun components and solves most of the mechanical issues of the build like a body that is comfortable to hold, a trigger, etc. The clear tube which serves as the barrel (the same setup as we saw in this coilgun guide) is protected by three stainless steel barrels which surround it. They each host a laser diode which results in a Predator-style aiming mechanism that is shown off in the video after the break. There’s even a night vision system that uses IR leds and a viewfinder attached to the stock. A camera flash is scrapped for the transformer inside. This acts as the voltage generator, charging up a few capacitors. It seems to have no problem generating enough juice to work well, despite the fact that it’s only being powered from two AA batteries mounted in the magazine. 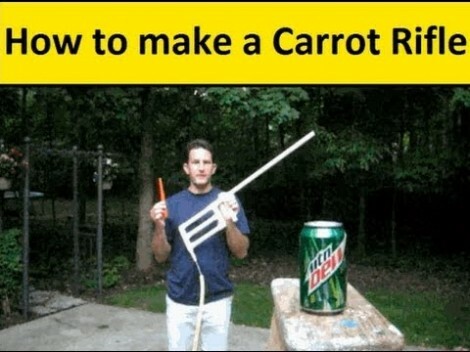 Just in time for your garden’s carrot harvest [Lou] shows us how to make a carrot firing rifle. It’s cheap, easy, and quick. If you’ve got 15 buck and 15 minutes you can have one to call your own. The loading method is quite easy. Shove a carrot in the muzzle as far as it will go, then cut of the excess. Finish up by using a ramrod to push the carrot stub the rest of the way into the barrel. Once you’ve gnawed down the rest of the carrot nub and connected a compressor hose to the rifle you’re ready to do some damage. The video after the break shows a carrot fired all the way through a cardboard box, and penetrating a gallon jug of water. [Lou] uses CPVC for the project. It takes just a few lengths of pipe, pipe fittings, a valve, and a threaded metal compressor fitting. After gluing everything together he threads the compressor attachment in place and heads to the firing range. 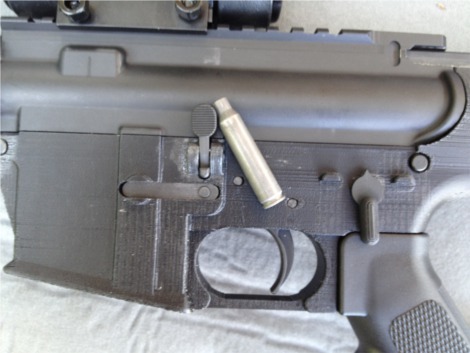 Ar15.com user [HaveBlue] has been working for some time on a 3D printed lower receiver, and now reports that the parts are fully working. Using a Stratasys 3D printer from the 90’s [HaveBlue] managed to spin out a modified version of an already available model from cncguns.com. He strengthened the holes for the takedown lugs, which hold the upper and lower halves of the rifle together. 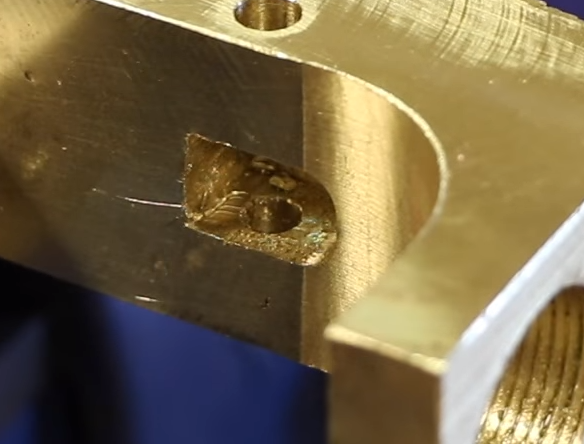 Strengthened the bolt hold lugs, which when the magazine is empty lifts a lever assembly that catches the bolt as it springs back to push another round into the chamber. and added an integral trigger guard AKA the bar that surrounds the trigger. Legally this print is a veritable gauntlet of state and federal regulations. At least in the US. The lower receiver is the part of the rifle that holds the spring and pins that operate the rifle’s trigger safety and hammer assembly, hold the magazine in place, and mount the buttstock/return spring tube. The other key point about the lower receiver is that it contains the primary traceable identification markings, the serial number. All of the parts that are contained within the lower receiver can be ordered online (this varies state to state). In fact, every single other part of the rifle can be bought and sold freely. The only component of the rifle that can not be ordered online, and requires a background check at a gun store, is the body of the lower receiver (we have to keep saying that this varies state to state). Typically laws allow though for the manufacture of this part without a serial number so long as it is never sold to another individual (again, state laws vary widely). There is some more info on the build at [HaveBlue]’s website here and here, but it is currently down. This sort of steps up 3D printing past the nerf gun stage, but we have seen shot gun and pistol hacks.